This is the first post of a Budget and Tax Center blog series on public services and programs that face cuts in the budget process or have been underfunded in past years. 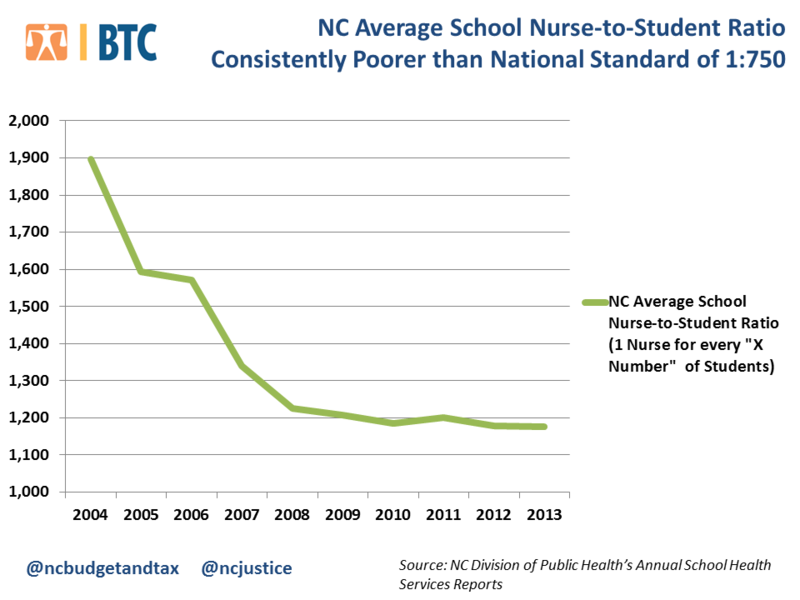 There would be 70 fewer school nurses in North Carolina’s public education program under the Senate budget, even though the statewide average nurse-to-student ratio has been far below national standards for at least a decade. In addition to this 30 percent cut to the School Nurse Funding Initiative, the Senate budget would shift the remaining 166 nurses to the state’s most economically lagging counties, known as Tier 1 counties. Apparently, the Division of Public Health “asked” for this cut in response to the Governor’s directive to cut spending by 2 percent, per the comments made today by the Fiscal Research Division staff. Senate budget writers factored agencies’ responses to the Governor into their budget proposal. Again, this is just another decision by leadership that makes clear the harmful choices that must be made when policymakers reduce the availability of revenue—which is what occurred when lawmakers passed last year’s tax plan that drains available revenue for public investments. The national standard for the nurse-to-student ratio is 1 nurse for every 750 students. North Carolina has not met that standard in any year in the last 10 years. In fact, the North Carolina average ratio was more than twice above the national standard for the fiscal years between 2004 and 2006. There was considerable progress made in lowering the ratio in the mid-2000s but further progress was stalled due to the Great Recession, as illustrated in the chart below. Unlike many areas of the state budget, the school nurse program largely escaped the wrath of budget austerity following the deep economic downturn. Given, how far off-the-mark North Carolina has been compared to the national standard, any further reduction to the program would have been detrimental to student health and learning. Such will be the harmful outcome of Senate budget proposal if it were to be implemented. The Senate budget would also shift the remaining 166 nurses to the state’s most economically lagging counties, known as Tier 1 counties, based on the goal of having additional counties meet the ratio. Yet, a cursory look shows that many of the state’s Tier 1 counties already meet the target ratio of 1:750, likely due to smaller population sizes, per the map below. Tier 2 and 3 counties, which also serve children who are low-income and lack affordable health care, would just be out of luck. Let’s hope that the House budget writers make no further cuts to School Nurse Funding Initiative. There are revenue options available. Policymakers should stop the additional tax cuts that are slated to begin January 2015. Instead, they should pursue much-needed investments that will build a stronger economy going forward. I have been a School Nurse for 33+ years. This will be a horrible blow to our School Health program and most importantly to our students. The legislature is looking at requiring all public schools to have stock epinephrine and train First Responders (nonmedical staff members) to identify and treat anyone on campus for anaphylactic reaction to unknown allergens. This new program requires a School Nurse to train staff and monitor this additional program. That’s great when they cut out a third of my nurses with this Senate budget proposal. Cut these School Nurses and put the students at risk. They want SRO’s on every campus but cut out School Nurses. Someone’s priorities are way out of whack. I am a school nurse in Davidson County. I was not only shocked, but disheartened when I received word of the possibility of cutting the SNFI program in chosen counties within our State. I am responsible for staff training, care-planning, acute care management, health education of our students, securing funding sources, arranging transportation, ensuring compliance with immunizations and Kindergarten Health Assessments, home visits, screenings/referrals/follow-ups…..the list could go on endlessly. I have nearly 900 PK-3 students in the school that I serve. I have over 150 identified asthmatics, nearly 50 identified (serious) allergies, and many others with diagnoses ranging from autism to cerebral palsy. I serve as liaison for children with behavioral/psychological issues. I communicate with parents and physicians within and outside our county. I am active with community programs (asthma camp at Thomasville Medical Center) to recruit students that meet the qualifications for and will benefit most from what is offered. I serve on the Counsel for Adolescent Pregnancy Prevention and the Health and Wellness Counsel of Thomasville City Schools. Can you imagine our schools without these services?? I don’t know that I can, and I don’t know that I want to. Children have gotten sicker, and schools have gotten more inclusive. The number of “sick” children in our schools grows yearly. Additionally, children have become more dependent on schools than home for much of the care they receive. They have no food, they need dental care, they have vision issues, they’re chronically sick, they have TRUE psychological issues — and we wonder why they can’t learn? School nurses keep these kids IN school where they need to be. We work closely with many community organizations to ensure these children’s needs are met so they can come to school and learn. It takes a village to give some of these children a chance, and school nurses are a huge part of this. To pull funding for SNFI nurses anywhere in this state will be to the detriment of our children. Please note that Davidson County already has THE worse student/nurse ratio of any other county in our State. I fail to see the promise in ensuring the needs of some counties are fully met while the needs in other counties are overlooked. I want to thank you for taking the time to read this, and I hope you’ll take into consideration the negative impact pulling SNFI funding would have on children, their families, and our schools.